In a collaborative undertaking for Webmonton Media's extensive economic development website for the City of St. Albert, ShiftUP Consulting was asked to create a searchable listing and business mapping page for the project. 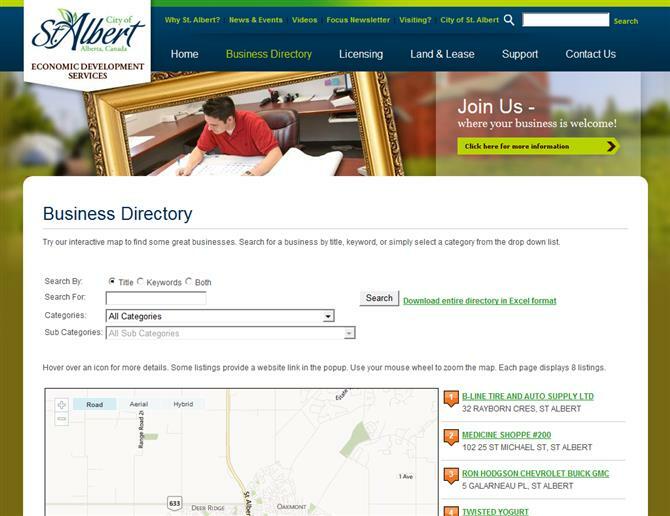 The website we worked with was created in a content management system called DotNetNuke and the custom module we created for it obtains the entire business directory from the City of St. Albert's live database of registered businesses. When a customer searches for a business category or name in the search section our software creates a paged list of all the matches and plots them on a map.